Marissa over at WhaHappen? recently ran an Act Like A Kid Contest. And while many of her readers had a lot of great ideas, not too many came through on documenting their fun via photo (check out the "winners" here>>). One of the things I took out of the contest was that bouncing is closely associated with fun, it also can be a great way to sneak in some exercise while having fun. 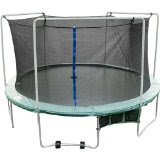 Trampolines offer a great way to have a lot of cool fun while bouncing and would make a great gift idea for the family.